It's not my place to 'let the cat out of the bag', but I can tell you there is a documentary about the sea and some of the more infamous villains who have sailed on it in the past, being filmed for a major network. 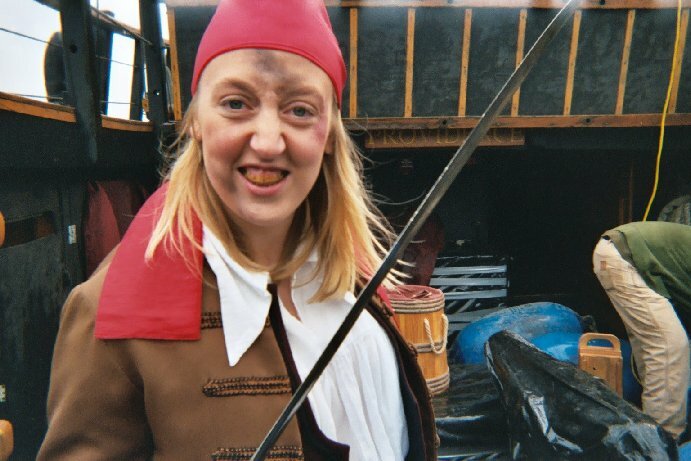 Above is a photo of one of the female pirates. Don't be taken in by the lovely smile - she'd just as soon slit your throat as breathe. In real life, this actress was a college fencing champion. 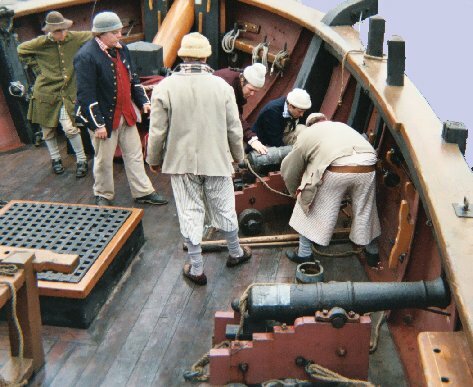 We also filmed a series of scenes of a gun crew working a six pounder cannon. The ship we used for this (not BOUNTY) was out of the water, and it was quite a climb to get all the players, film crew and equipment aboard. Since we were in the middle of a shipyard, we couldn't fire the cannons there. 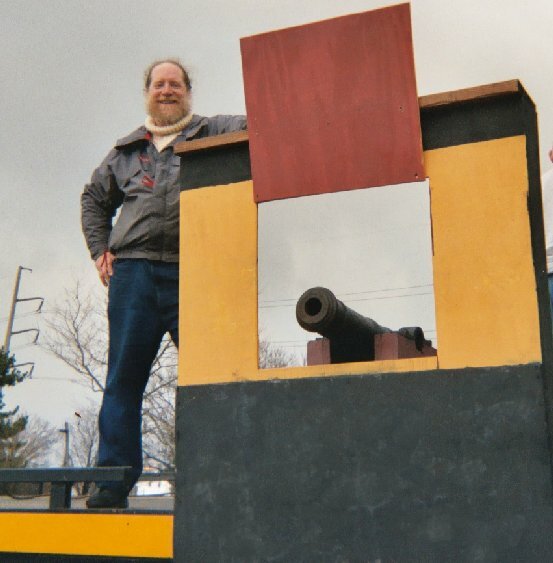 To obtain footage of the cannon firing, I was hired to replicate a section of the ship's hull that could be attached to a flat bed truck. We took the truck, hull section and cannon to a local waterfront park where we could make all the noise and smoke we wanted. It was late in the day by the time we got to the park, having filmed aboard ship all morning and early afternoon. It rained off and on throughout the day, but that didn't really dampen anyone's spirits. The production company filmed from behind the cannon and from in front, and managed their camera angles so only water and sky could be seen through the gunport. The finished product doesn't give a hint that the gun was not on the ship, and the ship was not in the water. I'm sure you can guess what this episode is going to be about. We filmed in Baltimore, on the 'tween deck of BOUNTY. The scene opens with Fletcher Christian (right) amusing some of the crew by juggling coconuts. That is yours truly sitting at the middle table, paring a breadfruit. Yes, it's a real breadfruit! The levity comes to an abrupt halt when Captain Bligh comes in and takes exception at the fun we're all having. Of course he vents most of his wrath on poor Mr. Christian, while the crew averts their eyes and plays dumb. Such brave fellows we are! The dark haired fellow in the vest, seated at the first table, is one of the professional actors. The other two with him are extras from the ship's crew. 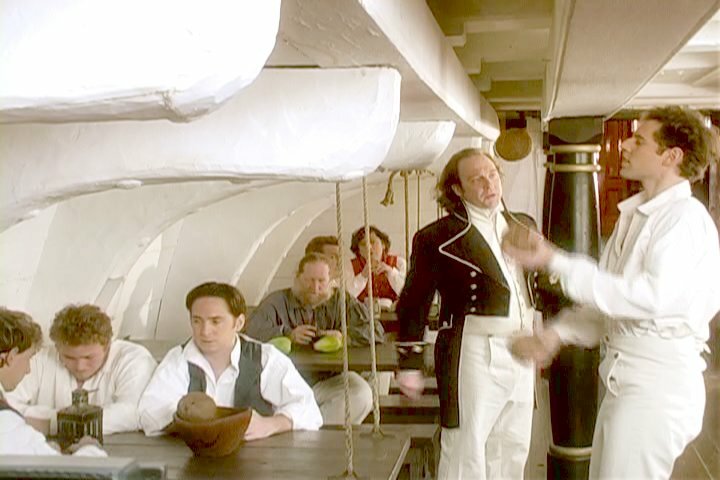 Here are two professional actors, seated at the aft table, discussing Mr. Christian's ability to lead the men. They represent Mr. Fryer and a midshipman.